Recycling Roman building materials became a lucrative business for builders of the new Christian cathedrals in the 12th and 13th centuries. 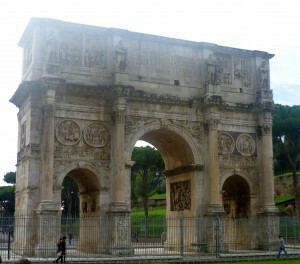 There were a few nods towards religious propriety – Constantine was the first Christian Emperor, so the Arch of Constantine in Rome was allowed to remain, but, otherwise, everything was up for grabs. Enter the Cosmati family, marble workers in 12-13th century Rome who became famous for their marble, and gold and glass tesserae decorative inlays. 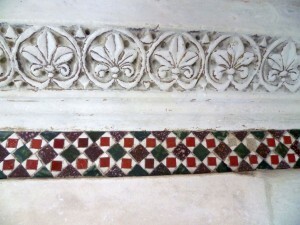 The style itself originated in Constantinople but the Cosmatis turned it into something special by their use of different sized and shaped marbles, as opposed the tesserae for Roman mosaics which were all the same size. By far the most expensive material was coloured marble (mainly reserved for Imperial projects): yellow from Tunisia; red porphyry from Egypt, dark green Carystian (cipillino verde) from Euboea; and red Phrygian from Central Turkey. 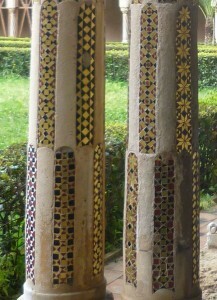 The Cosmati, with great ingenuity, sliced expensive porphyry columns as if they were salami and turned them into roundels within a geometric pattern, as in the example above from Monreale cathedral in Sicily. 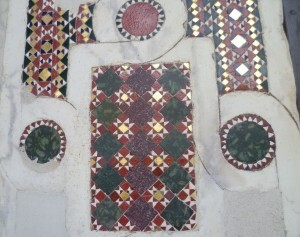 And, in acknowledgement of the art’s Ottoman origin, the geometric pattern above showing a decorative panel in Farfa Abbey exploits the mosaics’ potential to the full. Note the use of the expensive porphyry and the green Carystian cipollino verde: this Benedictine monastery could afford the very best. 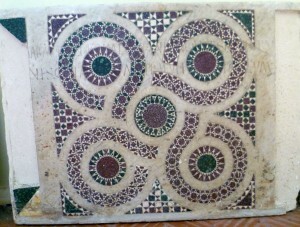 But Cosmatesque work could be small scale, too. 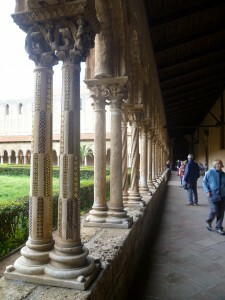 Take the columns of the cloisters in Monreale Cathedral, Sicily, where the decoration goes up the sides of the columns, sometimes straight, sometimes spiralling, and sparkles where it catches the sunlight. For many years, whenever I saw a Cosmatesque geometric pattern using a slice of what was once a porphyry column from a Roman temple, my first reaction was to think that the recycled marble would look so much better in the temple for which it was originally designed. It felt like vandalism. 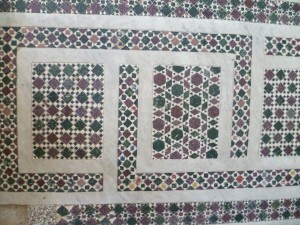 However, I have to admit that Cosmatesque work has grown on me and, nowadays, I can also see that the wonderful floors in so many medieval cathedrals with their swirling geometrical patterns are beautiful in their own right. How beautiful, Elizabeth! And fascinating piece of historical data. I had no idea about this. To my mind, it may well be vandalism, but at least the recycling keeps the beauty visible rather than allowing it all to fall down in ruins after millenia in its original space, if no one was looking after it. Must have been a wonderful trip! Thank you for your perceptive comment, Liz; I hadn’t thought about it that way. You are right, of course. The great thing about Cosmati work is that once you’ve seen it, and know it has a name, you begin to see it in all sorts of places. 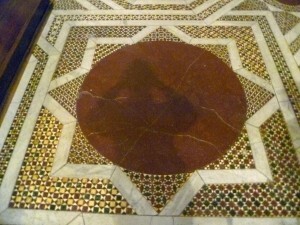 There’s even a Cosmati floor in Westminster Abbey – but, alas, it’s usually covered up to protect it! This is fascinating! I was aware of the recycling of the stones from Roman buildings, but not of the marble and not in this way. I’m a little surprised that the marble was still available all those centuries after the end of the Empire, and that no-one prevented the Cosmetic from reusing it in this way. Were the ruins from which they took the marble on land owned by those who also owned the buildings being decorated? That’s a very interesting point, Helena Justina. Far from being prevented, marble workers like the Cosmati were actively encouraged to make use of the marble which still covered many abandoned Roman public buildings and put it to good use in the building of Christian churches and cathedrals. Doubtless, a lot of small scale removal of useful building materials went on pretty soon after the empire fell. But it wasn’t until Christianity began to re-build on a large scale that the wholesale demolition began. And, as places like the Forum and the Colosseum occupied public space, there was no problem about ownership. I really enjoyed reading this post – and it chimes in perfectly with Mary Beard’s BBC Four Roman series, and the Dark Ages series, also on BBC Four. I do like the idea of these huge Roman edifices being put to good use, rather like a cook surveying leftovers after a banquet and using them to concoct something delicious. Previously I’d vaguely imagined that bits and pieces were chopped off the odd temple now and then when people were putting up their own houses, or extensions to them – it hadn’t occurred to me that the powers that be actually sanctioned the looting of materials in order to build on a grand scale. Thank you, Prem. I’m delighted you enjoyed the post. I think there was also a feeling, especially with regard to pagan temples, that somehow they were ‘Christianized’ by reusing the material they were built of. Sometimes, indeed, the entire temple was incorporated within the church, as happened with the cathedral in Syracuse, Sicily. Similarly, in the UK, (and possibly elsewhere) churches dedicated to St Michael are almost always built on the tops of hills over the remains of a pagan temple. The St Michael dedication is significant: he was the Archangel who fought and slew the dragon and thus symbolizes the defeat of paganism.